In THE LIVING COFFIN, handsome clean-shaven cowboy Gastón (Gastón Santo) and his useless rotund sidekick Coyote Loco (Pedro de Aguillón) arrive in a strange town, carrying a red figurine idol. Professing to be a student of archeology, Gastón is told by beautiful Maria (María Duval) that the idol -- a figure of a “crying woman” -- represents death and that it was carved by her late aunt Clotilde. The superstitions of the locals leads to the belief that Clotilde’s ghost now roams around the ranch house of Maria’s family, with the violent killings of several guests occuring to back up the theory. 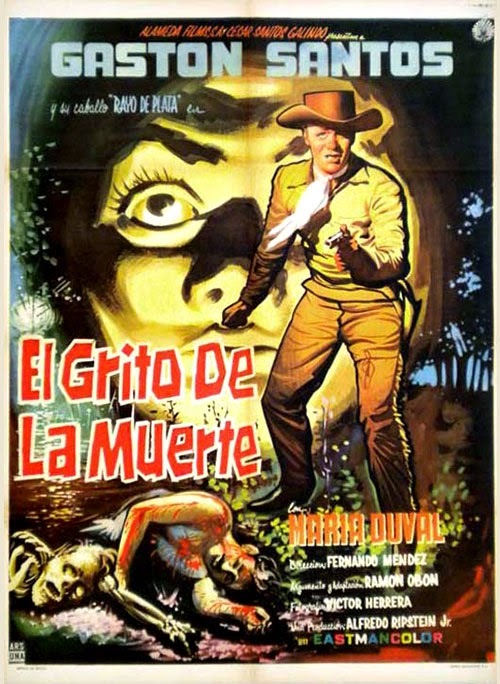 THE LIVING COFFIN is not that distinctive on a whole, but it does have some elements that makes it different than most of the other Mexican genre pictures of the era. First off, it’s in color, which was not very common. Second, it’s really a western with a number of gothic, haunting trappings tossed in to warrant its horror status. The ingredient of a sickly woman having a bell alarm affixed to her coffin in case of premature burial breathes of Poe, and the inclusion of the “crying woman” was a fixture in Mexican cinema. Here, she’s seen as a rotting corpse draped in a flowing shroud, creeping in an out of a secret crypt doorway. It’s somewhat startling to see the blood-drenched mutilated faces of several of her victims, especially considering when this was made. 1 Response to "The Living Coffin (1959) Fernando Méndez"